Brining the chicken takes it to a whole new level of tenderness and juiciness. So even though it’s a bit of a hassle, I tend to make the effort if I have time. 1. Combine salt with 4 cups cold water (1L). Stir until dissolved. 2. Butterfly chicken by chopping down the backbone to open the bird out like a book. 3. Place chicken and salty water in a large ziplock bag and pop in the fridge for 6-12 hours. 4. Remove the chicken from the fridge an hour before you’re ready to cook. 5. Preheat your BBQ or oven to 220C (450F). Remove chicken from the brine. Pat dry and rub with a little oil. Don’t season. 6. Cook chicken on a preheated BBQ plate for about 15 minutes each side, or until cooked through. OR roast breast side up for about 30-40 minutes or until cooked through. Rest before serving. I love leftover chicken so I’m happy to roast a whole bird even if there’s only 2 of us. If you wanted to do less, you could use 1 chicken maryland (leg with thigh attached) per person. And it’s no problem to roast more birds if you need to feed more. no brine – if you’re short on time just skip the brining process. not up for ‘butterflying’ – if the thought of ‘butterflying’ the chicken is a bit scary, or your knife just isn’t just up for cutting through bone, don’t stress. You can cook the chicken whole, it will just take a lot longer because there is less surface area for the heat to penetrate. If roasting I usually preheat a cast iron pan in the oven so it’s super hot then add the whole chicken breast side up and just leaves it for 50 minutes to an hour. On the BBQ, it’s a similar approach, leave the chicken breast side up for the whole time and keep the lid of the BBQ closed as much as possible. Expect it to take around an hour. flavoured brine – flavours added to the brine tend to really be absorbed by the flesh, a little like a ‘super charged marinade’. Slices of lime or lemon are good. As are dried or fresh chilli, kaffir lime leaves, thyme leaves, sage leaves, garlic. Pretty much anything that works with roast chicken. short on time? – either cut the chicken into quarters or use drumsticks instead of the whole chicken. Should take the cooking time down to about 20 minutes. And if you’re brining pieces, they’ll only need about 3 hours. different birds – chicken is a family favourite but you could also use spatchcocks (baby chickens) or jumbo quail. Adjust the cooking and brining time accordingly. vegetarian / vegan – roast or BBQ a couple of portabello or field mushrooms along with the chicken. Using a separate pan. Roast or BBQ mushies will be delicious with any accompaniments you’d normally serve with chicken. too bland – next time buy a better quality chicken I’ve found it really makes a huge difference in terms of flavour. For now, just season with more salt and pepper. 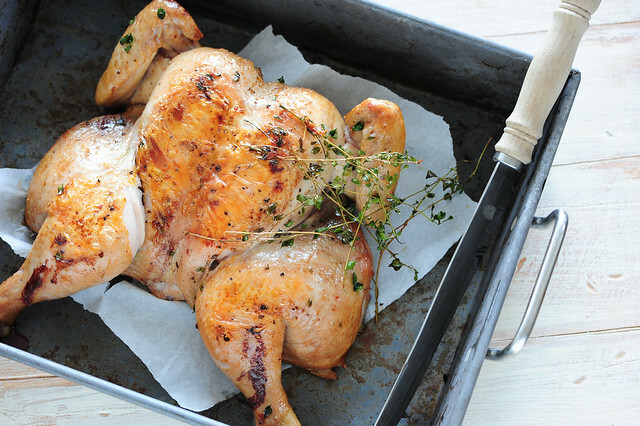 chicken not browning – if you don’t dry thoroughly enough the chicken will steam rather than brown. Next time make sure you dry carefully. The other problem may be your BBQ / oven isn’t hot enough. Use the fan assisted setting or if your oven doesn’t have a fan, increase the temperatures in the recipe by 20C (50F). chicken too pink inside – either it wasn’t cooked for long enough or the chicken was too cold before you started cooking, Next time make sure you allow the chicken to come to room temperature before you start cooking. too dry – some chickens are naturally less moist. Next time try another supplier. It could also mean your chicken is over cooked. not sure if the chicken is cooked? – don’t stress. When the chicken looks cooked and the the legs wiggle freely, just chop in half lengthwise and make sure there are no pink bits. If it looks fine, rest before finishing your carving. If the flesh is still pink, return to the oven for another 10 minutes or so. If there is a little red in the actual bone that’s fine, it’s the flesh that needs to be well cooked. Great on its own with a salad on the side. Also good with bernaise sauce, mayo or a roast chilli sauce. To carve, I usually just chop the bird into quarters – 2 breasts and 2 legs.